The original VapeOnly vPipe 3 is a high end e-cig pipe device made from rosewood that combines traditional pipe functions with new revolutions. The vPipe body has a LED light indicator and blinks from up to down when using. And the included BVC atomizer has a 1.2ml tank capacity and 0.7ohm resistance, which can be filled easily with all detachable structure. 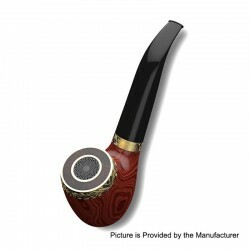 Luxurious design and superior technologies make vPipe III a piece of art work. This product comes without any battery.